It’s a been a crazy ride since Sydney hip hop/producer trio True Vibenation put out their second album ‘ON’ 9 months ago. They hit the touring circuit hard selling out their Sydney launch and playing to packed venues across Australia. Word quickly spread and it wasn’t long before they were on the plane to Africa for their first international tour, playing in front of thousands with main stage festival appearances alongside international legends such as Salif Keita, Les Nubians and Mi Casa and selling out their first international headline show in Maputo. Now the trio returns home for the Africa/Australia tour to continue the party with their brand of electronic beats, live horns and deft lyrics for a show that leaves every ounce of energy on stage and the audience grinning from ear to ear. Made up of twins VULI and Moody and childhood friend Klue, the trio hailing from Sydney’s inner-west, has developed a solid reputation for an electric live show and sound which is just as comfortable alongside a live band as it is in an electronic setting. They even have a self-made instrument that literally turns audience members into human drum machines! 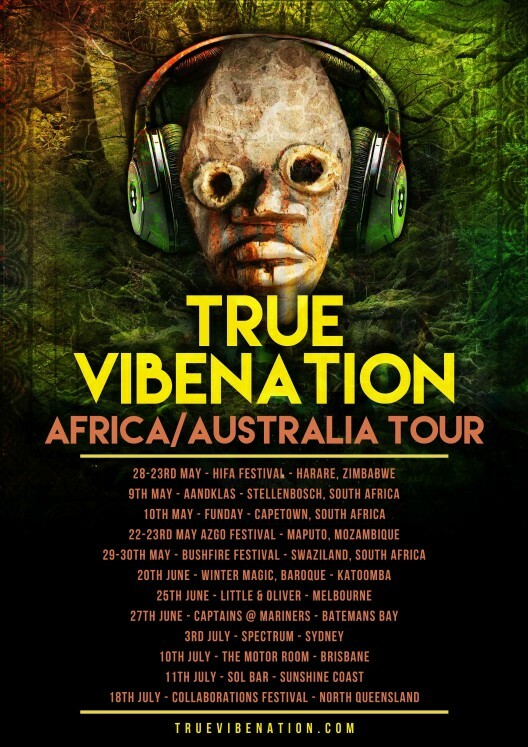 With hundreds of shows under their belt, festival slots at Sydney Festival, Peats Ridge, Future Music, Secret Garden, Subsonic, Woodford and Changing Lanes as well as support slots with Jurassic 5, Chali 2na, Dead Prez, Foreign Beggars, DJ Kentaro, Horrorshow Thundamentals and many more, True Vibenation are ready to play for their fans and add some new ones.